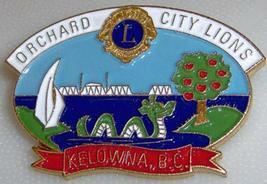 Hi, and Welcome to my Listing, This is a Lions Club Orchard City Kelowna B.C. Canada Dragon Pin. 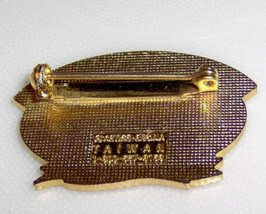 Measures 1 3/8" wide. Condition Real Good, Other than a few Light scratches, nothing serious at all. I always try to describe the condition of my items very accurately so there is no surprises if You were to receive this item. Please check out My other Listings, I also have other unique Pins listed, and I will be happy to combine them for savings on shipping costs. If You choose to purchase, Please do with Confidence, I have a Return Policy that I will Honor also My Feedback I receive is Important to me and Grades me as a seller, but More Important to me is having a Happy Satisfied Customer. Email me for any other questions on item description I will be happy to answer them. US SHIPPING DETAILS Buyer to pay Shipping and I will due my best to keep it as low as possible, and you will also get a Delivery Confirmation / Tracking Number, No extra cost for shipping to Alaska and Hawaii. Item will be Packed with Care and Shipped in a Small Box inside a New Padded envelope USPS First Class Mail at cost to the Buyer of 2.95. Shipping insurance is optional. Handling Time: Item will be shipped 1 to 2 business days after payment is received and you will receive a email when payment is received and when item is shipped. ___________________________________________________________________________________________ I will Also ship Out of the US, USPS First Class Mail International. International Payments: Pay Me Securely with any Major Credit Card Through PAYPAL.. I will be happy to combine shipping of multiple Items or you can email me for shipping cost on multiple items. PAYMENT DETAILS I accept PAYPAL. MONEY ORDER CASHIER CHECK PERSONAL CHECK, the item will be shipped as soon as the personal check clears through my bank. RETURN POLICY I will accept returns within 7 days of delivery if there is a major problem with my description or the item you receive. Please email me for any questions on my items to avoid any returns and I will be as honest and as accurate as I can on this end. I will work with you to make sure you are happy with the item you receive.